One of our first Village Characters was Winfield Scott “Scotty” Hudson. Scotty was born in Wisconsin on November 11, 1880. His father was Francis William Hudson, born in Canada. His mother Viola A. Hudson was from Pennsylvania. Brother William L. Hudson was two years older, and sister Lulu B. (or Lula V., depending on the Census enumerator) was two years younger. We first see him in the Village Council Minutes in August 1901, when he earned $10.95 working at a stable. 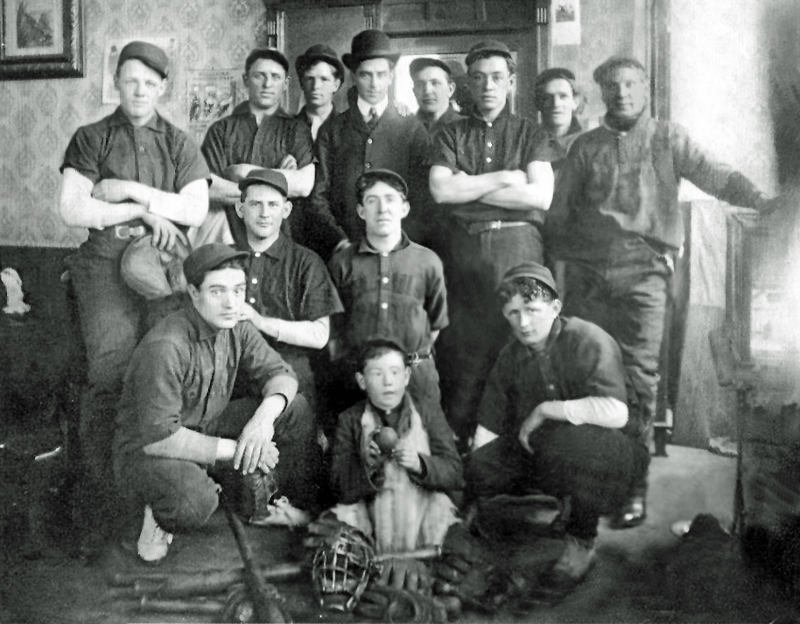 This photo, courtesy of the Hopkins Historical Society, is of a baseball team from 1909. Scotty Hudson is on the end on the bottom row. Scotty married Edna Drake, a St. Louis Park girl, in 1909, and they had a son, Francis Thomas Scott Hudson on September 29, 1909. Francis, known as “Young Scottie” or “Tic,” was part of the ensemble “Scottie, Billie & Mack” with Billy Klemick and Mrs. McCarthy. They often sang on WDGY radio. Ben Brown wrote: “Now there was a real rascal. Lots of stories about him” that he never got around to telling us. Tic and his wife Ann had a daughter Charlene. In 1940 he was a commodity clerk at a WPA storehouse. By 1951 he had relocated to Seattle, where he died on April 9, 1986. Scotty and Edna divorced before 1920; the year Edna was living with her mother, Louise Drake, on Goodrich Ave. Edna worked as a seamstress at a dry goods manufacturer. By 1940 she had remarried, to Charles W. Shutters, and they lived at 3800 Brunswick Ave. In 1920 he was a divorced man of 39, living with his older sister Jessie and her husband, George T. Williams, at their home on 37th Street. Scottie was listed as a core maker helper at Moline. The 1930 Census has Scotty living on Kentucky Ave., alone. His home value was listed as zero. This was the dilapidated old wreck called the Dewey House. Built around 1898, the fourplex was located at 31st and Kentucky Ave. It housed many tenants in its time, until 1925 when it was severely damaged in the great tornado. The owner, purported to be Superintendent of Schools Herbert Carleton, failed to make repairs, so tenants were forced to move out and it stood without electricity and deteriorating for over 30 years, its only known tenant being the aforementioned Mr. Hudson, who lived on its less-damaged side. The 1930 Census lists Scotty’s occupation as a “Utility Man” at Moline. Phone books in the 1930s listed him as a “lather.” Scotty is listed in the 1933-39 Village directories, but is gone by 1942. Scotty seems to have escaped the 1940 Census altogether. In the fall of 1946 he was apparently living in the west half of the Village Pump House at 6021 W. 36th Street (not an address today). Wherever he was, he died on December 13, 1963. He was especially fond of kids, and entertained them with his tap dancing, jokes, and stories. His usual greeting was “Scatta ma rat and a Bob tailed cat, skiddy, skaddy boo cat, stop that.” That was his way of saying hello, according to Ben Brown. He barely escaped with his life when the truck he was riding in with Howard Bradley caught fire when gassing up at Reiss’s; Howard died of his injuries, but Scotty got out in time.